McCall-Smith, a Scot reared in Zimbabwe, has a great sense of humor as well as a rebellious side. Reading his books evokes laughter from very young readers. 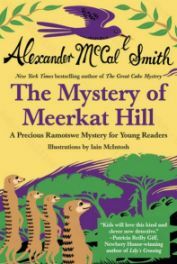 This mystery, the third in the in the Precious Ramotswe Mystery series, again highlights the detective skills of young Precious. North American students learn about the antics of meerkats, the cute carnivore of the mongoose family, indigenous to Botswana. A missing cow is the mystery and Precious with, the help of a pet meerkat, finds it. The serious theme of poverty is introduced but handled with a light touch. Precious posits several reasons for poverty and warns against blaming the victims. She also models good behavior towards new students, “…she remembered what it was like to be new in school” (13). Maps and the Reader’s Guide will be helpful to teachers, students and parents. There is even a recipe for fat cakes, a sweet favorite in Botswana. It would have been a nice touch to spell the word for chief, “Kosi” (30) correctly as Kgosi so that young readers would learn an authentic Setswana word.